As I see it, it’s no coincidence that these new judges hail from a predominantly solo and small firm background. In the legal profession, black women face a double whammy of discrimination based on gender and race. 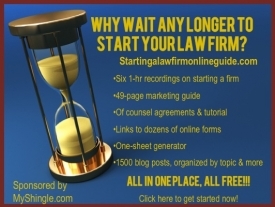 In these circumstances, starting your own law firm sure beats begging for scraps at biglaw. A recent study by Professors Milan Markovic and Gabriele Pickert ponders the “paradox of minority satisfaction”: why it is that “racial minorities are disproportionately likely to be satisfied in nominally low-status status practitioner positions.” (their words, not mine). The answer is stunningly obvious: because that’s where the opportunity lies. And as the recent victory in Harris County bears out, the opportunities that these black women law firm owners created for themselves are pretty darn awesome. Meanwhile, what the ABA and other professional groups simply do not comprehend is that the well-intentioned biglaw retention initiatives designed to promote equality at biglaw (the so-called “upper echelon of law practice) actually hurt women lawyers, and particularly women lawyers of color more than they help. The constancy of having to prove yourself day in and day out can take a toll on even the toughest female lawyer’s self-esteem. And putting your fate in someone else’s hands encourages female lawyers to relegate themselves to passive, permissive seeking roles rather than fostering proactive conduct. Few women at biglaw would ever dare to run for a judgeship on their own because they’ve been bred to believe that they need to wait for a committee’s approval and permission. By contrast, when women start law firms, the experience if nothing else is empowering. Even if you start out broke and spend much of your career as the boss of one, you still own it. You call the shots for your clients, you make the rules, you wake up every morning scared to death that the phone might never ring again and then you get up the next day and do it all over again. Over time, you become invincible enough to really believe that you can change the world. And then like the black women who will ascend to the bench in Harris County, you actually do it. What an epic victory for equality in the legal profession and for Team Solo ! *Of the other victors, one is already a sitting judge, at least one is not an attorney (though she owns her own business), one works for Harris County and two are employed by small firms.